Understand the pros and cons of two popular roofing choices—metal and asphalt shingles. If it’s time to install a new roof, the variety of options available can floor you. Asphalt shingles have long been known for their reliability, cost-effectiveness, and ease of maintenance, making them the most popular roofing material on the market today. But now there’s a variety of options that deserve consideration—especially metal, the second most popular roofing material thanks to its durability, longevity, and a wide selection of styles. Though both materials are great options for residential roofing, one may be better suited to your needs. 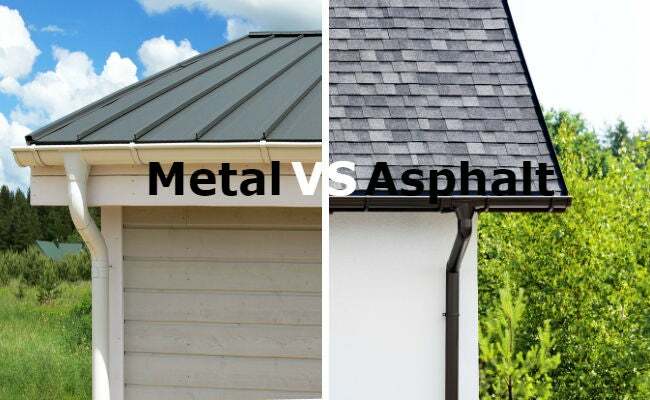 So we stacked them up against each other—metal roofs vs. shingles in asphalt—comparing everything from aesthetics to eco-friendliness to help you make the right decision for your roof. Both materials have finish options for every housing style. While shingle roofs have a traditional look of their own, nowadays they’re being manufactured to mimic the look of slate, wood shakes, and tile. You can find them with scalloped edges perfect for Victorian homes or with a terra cotta look appropriate for a Mediterranean home. The color palette is wide-ranging and there’s a host of different finishes as well, from slightly weathered (to complement older homes) to subtly multicolored. Traditionally, metal roofs were made of corrugated tin panels (called standing-seam metal) that evoke images of barns or sheds. But metal roofing—in zinc, aluminum, galvanized metals and even copper in addition to tin—has come a long way from the farm. 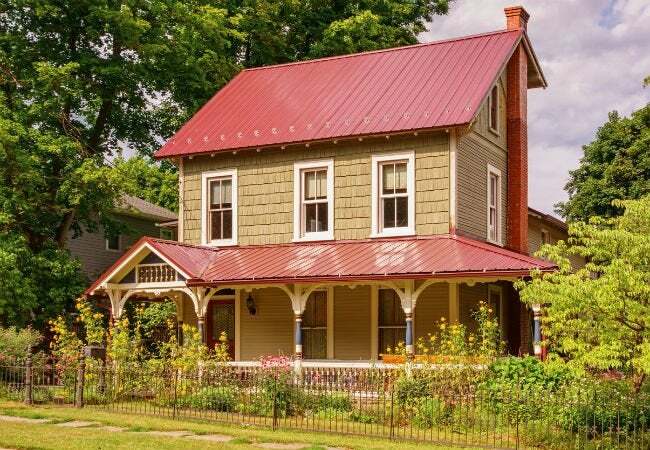 You’ll see metal roofing that suits less rustic, more refined structures, from California contemporaries to East Coast Victorians, in a spectrum of colors and finishes, and in shingle, slate, and shake styles. Because you can likely get the look you want from either metal or asphalt shingle, don’t let appearance be the deciding factor; instead, choose the material that will perform best for you. Metal roofs tend to be more durable. Metal roofs can stand up to nearly anything Mother Nature throws at them, so you’ll find that they come with 30- to 50-year warranties, and often outlast that with lifespans of 40 to 70 years. Metal roofs are not without weaknesses, however: Extreme hail or falling branches could dent a metal roof, as could walking on it improperly. Discuss vulnerability concerns with the manufacturer. You’ll learn, for example, that steel is hardier than copper. Shingles have a shorter lifespan due to their own unique set of weaknesses. Pooling water and chronically damp conditions can lead to algae and fungus growth, ice dams can create cracks, and temperature spikes between day and night can reduce the life of your shingle roof. Shingle roofs come with 15- to 30-year warranties, depending largely on the region, environment, and climate. Shingle roofs are cheaper up front. Though you’ll get more life out of a metal roof, you’ll pay the price at the time of installation. Metal roofs generally can run from $120 to $900 per 100 square feet (one 10-foot by 10-foot area, or a “square” of material), while asphalt shingles will be between $100 and $200 per 100 square feet. Its installation will also run you more for metal since it’s a more specialized job. You may recoup some of the costs of a metal roof down the road, because you likely won’t ever have to replace it. Additionally, insurance companies may offer discounts to homes with metal roofs. 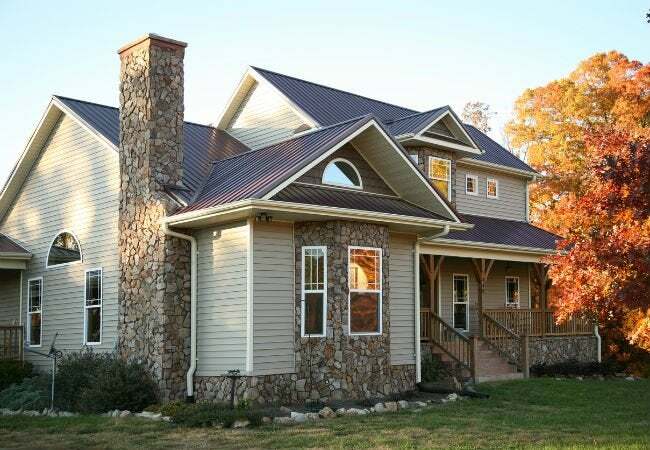 You may even qualify for tax credits by installing a metal roof on your primary home. Finally, metal roofs are so energy efficient they can save you money in monthly heating and cooling costs. Metal roofs are more eco-friendly. Because they’re largely made of recycled material and can be recycled again and again, metal roofs are considered a more sustainable choice than asphalt shingles. Metal roofs are also more energy-efficient thanks to their reflective qualities, which can block heat transmission to the home’s interior. Specialized paint coatings can further reduce your cooling bills. Asphalt shingles, on the other hand, need to be replaced more frequently than metal roofs; it’s estimated that U.S. landfills receive nearly 20 billion pounds of old asphalt shingles annually. Also, asphalt shingles are a petroleum-based product, which increases dependency on fossil fuels. Asphalt shingle roofs generally are easier to install and repair. For pros, the work requires little specialized knowledge and basic tools. Shingles can be installed in a day or two in some cases, sometimes right over the existing layer. Metal roofing installation typically requires a more skilled and specialized tradesman. The job is more precise, with less room for error, so it won’t move as quickly as a shingle installation. However, some lightweight metal products may be able to be installed right over an existing roof in good condition, simplifying installation overall and eliminating the cost of ripping the original roof out. Likewise, repairs are also easier for shingles than metal roofing. 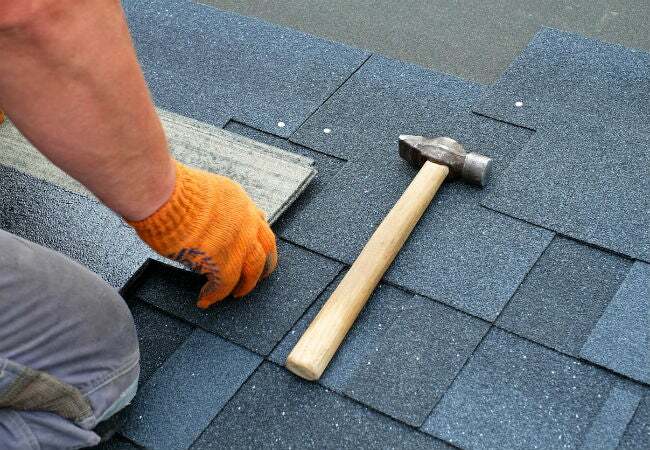 Though roofing manufacturers don’t recommend do-it-yourself jobs—you could likely void the warranty—asphalt sheets are easier to work with than metal ones, since they can be cut down to size and retrofitted to the roof with little difficulty. Metal roofs are harder to replace individually, due to the way the metal panels are joined together, and typically require a retrofit of an entire panel.